Making new friends over Twitter still blows my mind sometime. One of my newest Twitter friends, Kathleen Schipper has shared a guest post below about her book and is doing a book giveaway! Do you ever feel that evil is hot on your heels; around every corner; waiting for your moment of weakness and often in disguise? If so, you are not alone. Perhaps it would be easier if you could receive messages, signs, and direction through metaphysical abilities. BUT what if that made you more of a target instead? Full of humor, adventure, and suspense..this page turner is both entertaining and heartwarming. 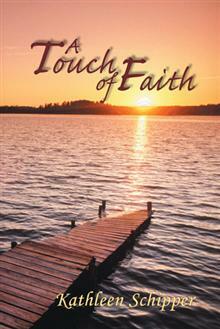 "A Touch of Faith" is the first book in a new series "The Angel's Advocate Group". Author Kathleen Schipper became inspired one evening while having a conversation with her teenagers about the mystery of dreams and the haunting feeling of evil's presence at times. Their ideas continued beyond the realm of possibility, and she was convinced by her children to write the story. "A Touch of Faith" will leave you feeling stronger; noticing the good that lies within yourself and those around you. GIVEAWAY: In the comments section, give us the title of the last YA book you read. One US winner will be randomly selected to receive the book after noon on Tuesday, May 29th. Right now I'm reading "the one you love" before that I read entwinted ..... good stuff! Sounds like a great book. I am reading A Lineage of Grace by Francine Rivers. Just finished reading The Fiddler by Beverly Lewis. I just finished "Ashes" by Ilsa Bick. Great book!! Amy - you won! Please get in touch using my contact form with a mailing address. Thanks everyone for reading.